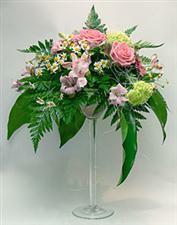 Stylish exquisite composition in a transparent glass, in a pale pink palette, consisting of Alstroemeria, pink roses, viburnum, Matricaria, and various greens. Especially successful this will be to look at the holiday table or in the interior, and will put you in a festive mood. You want to hit?? Then this is for you! 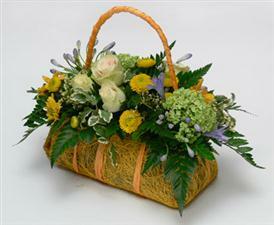 Interesting flowers, as if growing up in her purse, will delight and surprise your darling. Original composition from colors executed in a usual mug. In its structure a multi-colored chrysanthemum, statis, a carnation a spray. Interesting composition, resembles a real tree in the garden of Eden. The sculpture consists of a variety of chrysanthemums, baby's breath, Hypericum berries and greenery. Interesting the inserts can be different, according to your desire. Самый стильный букет цветов. Подойдет в подарок как для мужчины, так и для женщины. 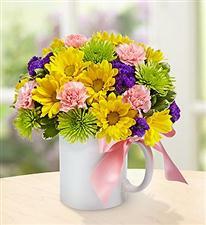 Bright orange gerberas, combined with purple create a sense of beauty and celebration. The composition is supplemented purple delphinium, soft cream roses, sprigs of reeds and other greens.